Reduce heat and continue to simmer for about an hour, still stirring occasionally. Continue reducing until mixture is thick, ivory in color, and is down to about 1/2 cup. 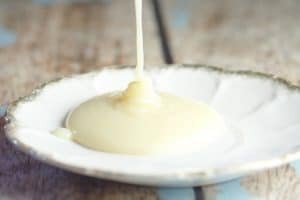 Did you like this Homemade Sweetened Condensed Milk Recipe? Find more on my In the Kitchen board on Pinterest! This recipe is so useful thank you! I will definitely save it for later. I’m always running out of ingredients I need like this one! I had no clue you can make your own! Thanks for sharing at the Thursday Favorite Things Blog Hop! I’ve always wondered how this was made and I will have to try this next time. Thanks! adorei esta receita vou testá~la com adoçante de forno e fogão. Just came across this. What kind of milk can I use? Would it matter if I used 2%? 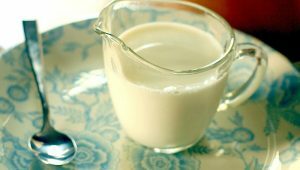 You can use 2% to make it, but it just may not taste as rich as a whole milk version of it. This is great! Thanks for sharing!! 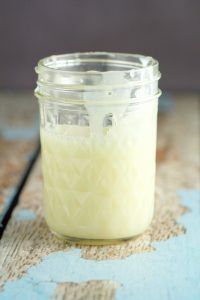 Do you think using Splenda would work for a “sugar free” sweetened condensed milk? I have a family full of diabetics and am always looking to cut sugar! I’ve never tried it, but it might! I think it might be a tad more runny since the sugar makes it sticky, but as long as you reduce it down, I think it could work. Let me know how it goes if you try it! Hi! I plan on using this recipe for tonight’s no-churn ice cream! Quick question, how long do I leave the mixture boiling and how high should the heat be? It takes about an hour to reduce it down. Start off with medium-high heat to bring to a boil. Then reduce it down to medium to medium-low, depending on where you see it start simmering. Tried this with refrigerated coconut milk and coconut sugar. Didn’t reduce at all. I’ll give it another try with another milk and sugar. Really hoping to find something dairy free that works. Thanks for posting this recipe! Did you ever find a dairy free combo that worked? Thank you, thank you, thank you! 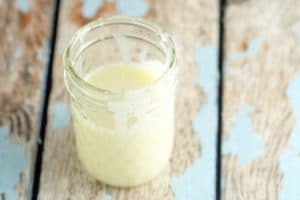 Searched for a recipe for Sweetened Condensed Milk (for my Iced Coffee recipe) and found a boat-load all with added fat (butter) then stumbled on your recipe. PERFECT!!! Will never buy canned Sweetened Condensed Milk again! Thank you for sharing truly appreciate it! Update: My second batch (made exactly to recipe) resulted in a thick (peanut butter like ) and grainy consistency. Although it tasted good, it wasn’t pourable whatsoever. Anyone have any ideas where I went wrong? Appreciate any help. Did you use it in a recipe or did you discard it. Mine has turned out thick as well. If a recipe calls for one can (14oz) would I have to triple this recipe? You’ve made it sound like the amount made would be the equivalent when needing a can but your recipe says it only yields 1/2 cup. Just want to clarify. A can of sweetened condensed milk is about 1 1/4 cup, so you would need to adjust the recipe accordingly, yes. To get exactly as much as in the can, use 1 1/4 cups sugar and 3 3/4 cups milk. I have made this recipe many times now and have had different results. I always get hung up on simmering it down to 1/2 a cup. When I leave it too long it starts to caramelize and becomes way too thick. 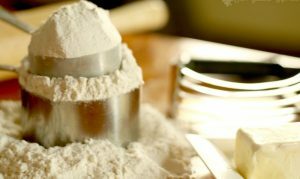 However, if this happens there are a few great cookie recipes that call for condensed milk and this “whoops” works well in it. I hate waste. I don’t know if it’s our high altitude in Calgary but when you simmer it down for an hour it’s not overly thick, but settles nicely in the refrigerator. I get approximately 1 cup from it. As well. I find it beneficial to whisk it in the pot regularly to keep it smooth. I love, I repeat love this recipe! I will never buy the canned version ever again. I mostly use it to make my own coffee creamer and use 2% milk since that’s all I buy. I do more of my decadent cooking for the holidays and will use whole milk then. Can’t wait! I can never get it reduced enough for the exact amount that is in the can but oh well the more the merrier. I would like to know if I use skim milk will it come out same. I love this recipe Very much. Some time went you need it you get it. I am on a keto program. Could I use coconut milk or almond milk + Splenda or Erythriol to make it. I’m not sure if that would work. I’m guessing you’d have a better chance with coconut milk than almond milk. I can’t say for sure how either will work though, since I’ve only tested this recipe with the ingredients I listed in the recipe. If you do try it, let me know how it goes. I’d love to share a keto-friendly option in the recipe notes! I can’t figure out what I’ve done wrong, but I want so badly to figure it out so I can make this recipe! Right when my mixture began to boil, I immediately turned it down as low as my stove would go. After about 20 minutes it began to curdle. Any idea how to fix this? Thanks! I’m not sure if you can fix a curdled batch. But if you were to try it again, you might want to try turning down the heat even further after it comes to a boil, all the way down to low. And if you’re using a larger pot/pan the cook time will be different, so be sure it’s a medium sized saucepan. 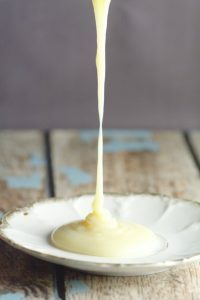 Can you make sweetened condensed from condensed milk, I bought that accidentally? I know the health benefits of the milk and milk products and that’s why I have my own healthy dairy products business. 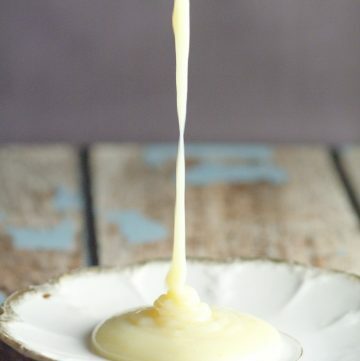 Condensed milk is one of the few milk and milk products rich in milk proteins. It combines nourishing value of both malt and milk, making it a power drink. It’s a passion to express myself and to make humans healthy.